Disclaimer: the Ezoic links in this article are affiliate links. However, the review below is genuine and not trying to hide any bad points. We’ve been approached in August last year by a company named Ezoic, who claimed they could double our adsense revenue. They were not the first, not the last ones to make that kind of claim, and we usually dismiss those (adsense remains one of the most professional networks out there). What Ezoic does however is automated A/B testing of your site’s design and layout. Their automated system detect the content from your pages, and renders it with several different templates. Each one of your visitors is served a unique template (the template doesn’t change wildly under one person’s feet), but different templates are served to groups of your audience. This allows Ezoic to compare which templates are good performers, and which ones are doing poorly. As a huge believer in A/B testing for ads, this got me interested. You can choose what “performance” means to you: it can be bounce rates, number of pages per visit, or it can be adsense revenue. Ezoic state that if you focus on improving the user experience, revenue will follow. Their default performance setting is a mix of adsense revenue and user experience metrics. This can be configured easily. We’ve tried Ezoic on our sister site for the past 6 months. Ezoic claim that all people who have tried their system see at least a 50% boost in revenue. They also say that on average, people see closer to a 200% increase (understand revenue multiplied by 3). I can confirm that in my case, I have seen revenue multiplied by 1.8 (80% boost) compared to adsense. 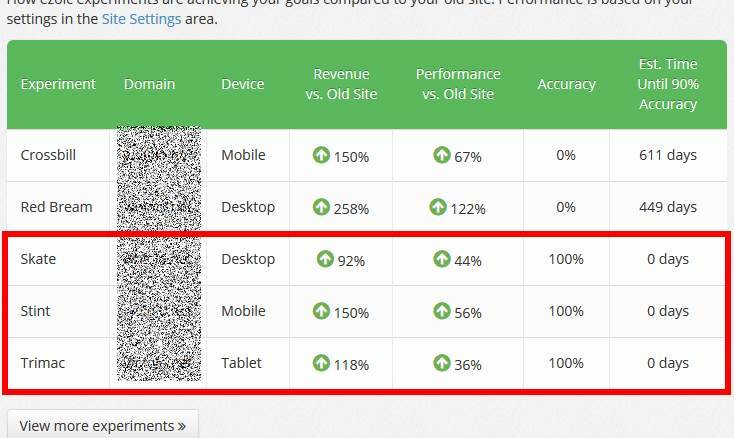 This screenshot from our revenues show that we make somewhere between 92% (1.92 times) to 150% (2.5 times) more revenue compared to our adsense account, depending on the device. (Note: Time to accuracy needs to be 0 day for the results to be statistically significant. Crossbill and Red Bream templates in the screenshot above are still being tested, and therefore the results are not significant). So why am I saying that we “only” make 80% more? That’s because Ezoic are constantly testing other layouts to a portion of our audience, and those layouts might perform a bit less than the best performers above. But your layout is not the only thing where you give Ezoic control. You’ll also need to give them access to your adsense account. Now, before you freak out, Ezoic are a google certified publisher partner. Not only does it mean that google adsense thinks it’s ok for Ezoic to access your adsense account (this is a good thing), it also means they handle all policy violations, etc… directly for you. If you’ve ever been sanctioned by an adsense policy violation, you know it’s a big deal to not have to deal with those. Another problem with ezoic is that it might take several weeks for it to perform at its full speed. While the system is gaining knowledge over your customers and trying new templates, it tries pretty much every single one of them, even the bad ones (they’re not bad in absolute, but it’s possible these designs don’t work well for your specific audience or your content. The Ezoic system, entirely automated, can’t know that a head of time). As a result, in my case, it took roughly 12 weeks for the Ezoic revenue to match, then beat, my adsense revenue. Today, as explained above, it still tries underperforming layouts, meaning the average boost in revenue is lower than it could be. That’s the cost of constantly trying new layouts. Should you try Ezoic on your website? If the idea of doubling your adsense revenue, at the cost of losing some control over your site’s layout is appealing to you, then Ezoic might be the right choice for you. They’re the only serious adsense “competitor” I’ve found so far, having worked with dozens of companies in the industry. As an adsense certified partner, they only show “respectable” ads. Ezoic also have a strategy that makes sense technically (A/B testing to leave human decisions out of the process, and let the numbers speak for themselves), and this is one of the main reasons I stick with them. If you jump in with them however, be ready to commit at least a few months of testing so that their systems reach their full potential with the right design for your site. In case of doubt, I found that their support team is really helpful to understand if my site was performing ok or not. By the way, this goes without saying, but Ezoic is a completely legit company: They pay on time, and their client support is top notch. Oh, and it’s free for informational/news sites. You can try Ezoic here, it’s free. I can’t believe that those are actually your numbers. I tried Ezoic and they destroyed my layout. Their automated system not only plays around with your ads to find the optimal location. That i get. They move your content around and make it unreadable all to put your ads on top. They need to do better. Yes, I’ve seen some templates where the result was purely ugly, with lots of ads at the top, and I was extremely worried, in particular in the first months. The Ezoic team basically told me to chill out and see how things would evolve. It was essential for me to not freak out for the first 3 months, yes, 3 months, because in those first 12 long weeks, the automated system is trying lots of things, including stupid ones. But, as time went buy, the “bad” layouts were eliminated automatically, and only the good things were left, for the most part. This is basically because the automation works: if users don’t like a specific layout, for example if it shows too many ads, then they’ll quit the site immediately, or they won’t use it as much. It will directly impact the bounce rate and “average time on site” negatively, giving that specific layout a very bad score, and ensuring it doesn’t show up anymore. BUT, doing that kind of automated A/B testing takes time. So, the main question is, how long have you tried Ezoic? In my case, it took 12 weeks for the results to really show up. Last but not least, Ezoic have a “light” mode where they can change positions of ads in your existing layout without enforcing a different layout on you. I have yet to try this but it sounds quite interesting to me.